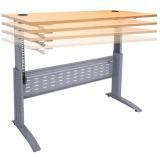 Height adjustable desks have become very popular items for both the modern workplace and the home environment. At Adco Office Furniture, we’re proud to have the RIGHT height adjustable desk in Melbourne for anyone who’s concerned about excessive sitting. Our specialists understand the importance of maintaining a healthy working environment, which is why we offer height adjustable office workstations in Melbourne that are innovative and affordable. 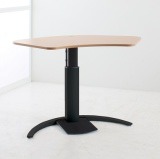 The benefits of a height adjustable desk or adjustable height table are numerous. 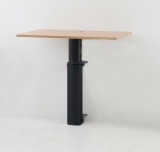 These benefits include the practicality of multiple users sharing a desk of variable height as well as the obvious health and comfort benefits that a sit stand desk in Melbourne provides. 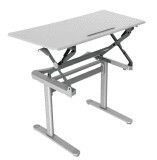 Adjustable height computer desks or sit/stand desks can be a great investment that gives your office more flexibility. With an increased awareness of the effects of prolonged periods of sitting, more and more office workplaces across the world are adopting the innovative practice of installing manual and electric standing desk solutions. 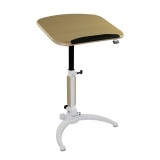 This allows for both sitting and standing positions. Besides the health advantages of height adjustable desks and workstations, these office furniture solutions generally take up less space than their traditional counterparts. 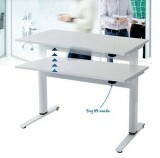 Adco Office Furniture is your one-stop shop for an electric height adjustable desk in Melbourne. To learn more about our products or to buy standing desk solutions, get in touch with our friendly team today. Simply call us on (03) 9808 4404 or enquire online for a prompt response.